In essence, that was exactly how I felt over winter break, when I was back home in New England. Why did I feel this way you may ask? It is because, with a huge thanks to my aunt Cindy, I had a temp job at MIT in the Department of Brain and Cognitive Sciences. 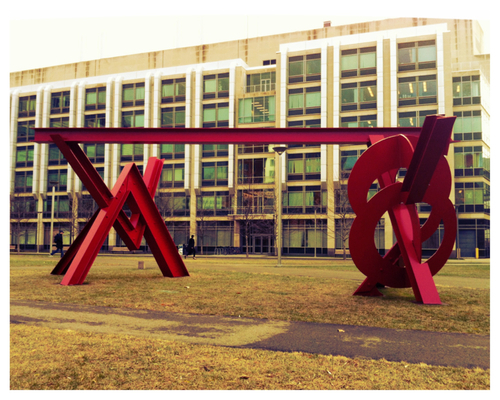 Having a job at MIT, located in Cambridge, Massachusetts, may sound all official and prestigious, considering the reputation of the university itself. But the reality was that this was nothing more than just your basic office assistant job which I got the opportunity to have for a little while. A really awesome office assistant job, though. My work days throughout my three-week winter break consisted of the usual making copies, typing things into Excel spreadsheets, rearranging office furniture, organizing office supplies, and storing records – typically working side-by-side with my awesome Moroccan coworker/friend who simultaneously taught me Arabic words as we went along and completed these tasks. 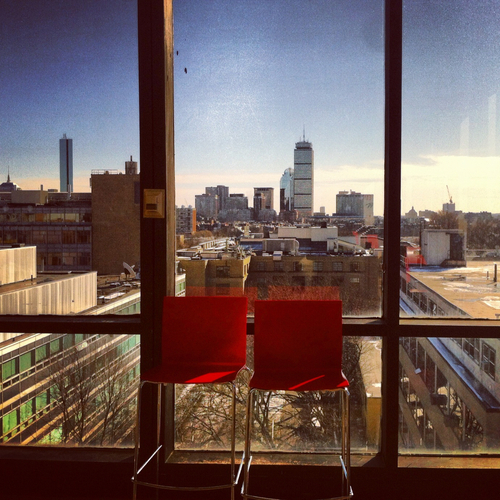 A pretty view of Boston’s skyscrapers in the distance at lunchtime. Minus the fact that I got to improve my Arabic with my new friend, all while replenishing my bank account, it probably sounds as if it were relatively boring. Just busy-work and the such. But surprisingly, this little job was a whole lot more than that. First of all, I got to meet a whole lot of really interesting people. Most of them were grad students who worked as research assistants at the lab where my aunt was in charge, doing all sorts of behavioral testing to study the brain. And the one thing that unified all of these people, besides working in the same place, was that they were all really, really intelligent. That’s where the whole “I’m surrounded by brains” thought comes in. 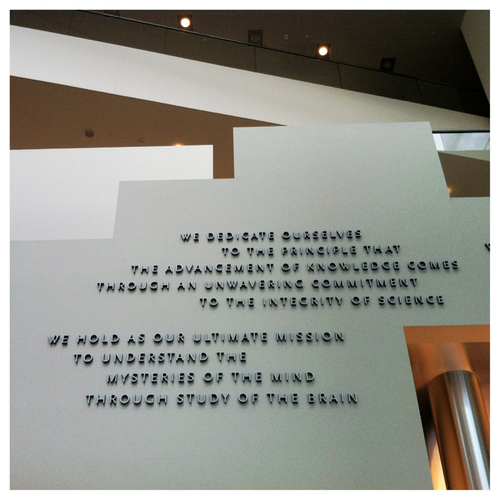 No matter where I went, I was in fact surrounded by brainy people. Simply by talking to most, you could tell. Many of them thoroughly enjoyed going into depth while describing different behavioral tests and research they were undergoing, what aspects of brain functions they were studying through this testing, and all about their studies in neuroscience. Brainy people talking about brains. Yep. It was pretty darn cool if you ask me; definitely a unique experience. And when I talk about feeling as if brains are all around me, I’m not just speaking of these intelligent people. I’m also talking about the brains themselves. Not real brains, mind you. I mean photos, drawings, plastic models of the brain, brains to wear as part of a costume, brain scans, brain posters, magazine upon magazine upon book upon newsletter all about brains. Wherever I looked, there was a brain, excluding the actual, functioning organs inside every person’s skull. 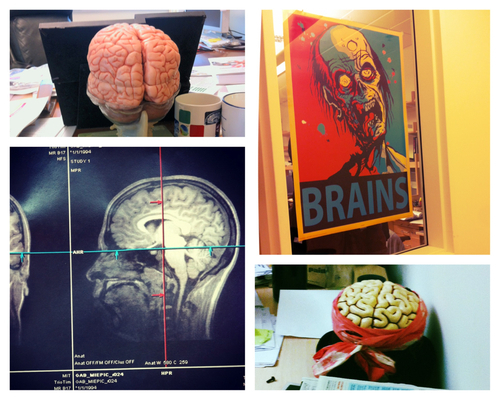 Speaking of brain scans, I even got the chance to take home my very own. I got paid (You heard right! Paid!) to participate in many different behavioral tests these researchers were performing, including one during which I had to get an MRI. So as a result of sitting in this MRI for a very long time, pressing buttons and taking some sort of test, I received some cool images of my brain from all different angles. And I got paid to do it too. Pretty sweet deal if you ask me. And what made this job coolest of all – I even had time to do what I love most: explore. Once in awhile, there just wasn’t any office work for me to do nor behavioral tests for me to take. And as a result I had free time to do, well, whatever. So of course I chose this time to take mini adventures. 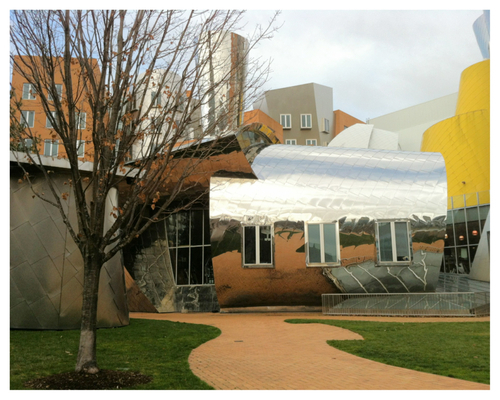 I took off and ventured through the many buildings of MIT, around the campus, and around this part of Cambridge. I had never actually been to this part of the Boston area nor to MIT before, which may seem surprising given that I’ve lived in New England my whole life. 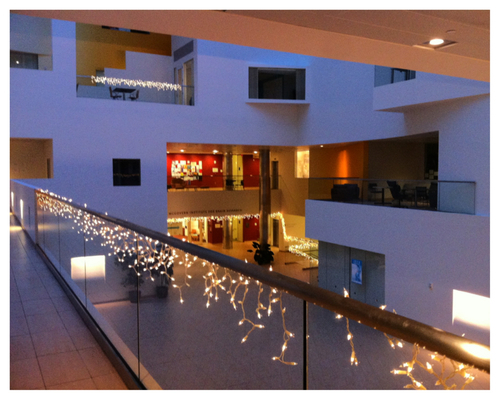 I really enjoyed getting lost then finding my way through all the nooks and crannies and hidden corners of the area. 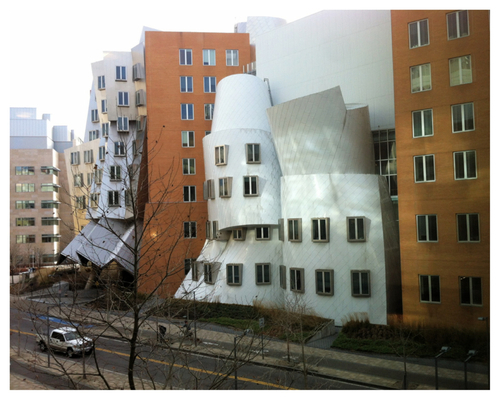 I especially loved the insane-looking, quirky architecture of MIT’s Stata building. It’s built into all kinds of cool, unique shapes, and has a colorful and also reflective, silvery surface, which kind of reminded me of the Guggenheim Museum I had seen in Bilbao. 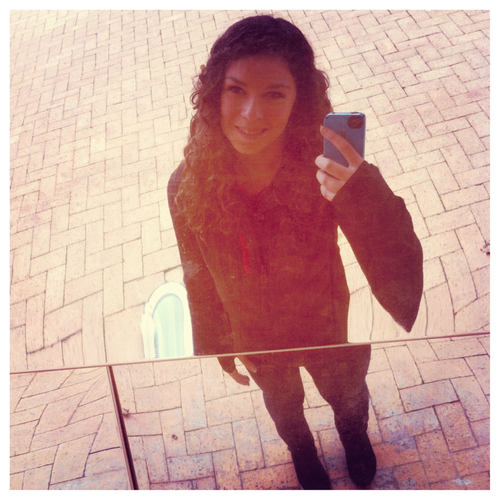 Many parts of the building’s exterior were also reminiscent of a house of mirrors, and I must admit that I had my own share of fun posing and photo-snapping of my reflection while walking around the building! All in all, if you leave out the fact that I had to wake up insanely early for the Boston commute, it was a fascinating experience, and I’m so glad that my aunt gave me that opportunity! Especially considering I was in serious need of funds for my second semester. Have you ever had any cool temp jobs? I love it. 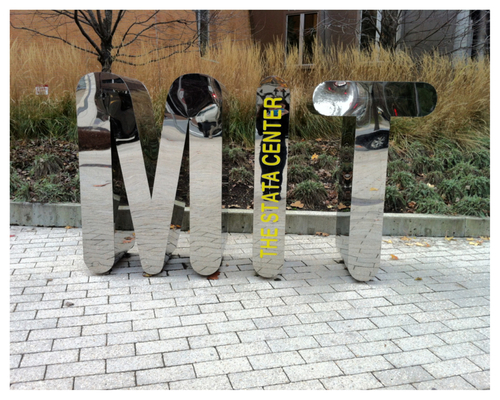 You did MIT proud!! You can come back anytime for more adventures, brain scans and of course, work! !